The staircase is a key element of your home’s architectural design, as well as a reflection of your personal style and taste. Our curved stairs combine structural strength with luxurious looks to give your hallway a real wow factor. As long as you have the space, this style of staircase can make a stunning visual statement. The art of designing, planning and sourcing exactly the right materials for creating a curved or splayed staircase is not something that can be learnt overnight. The craftsmen at Pear Stairs have spent more than two decades perfecting the method of manufacturing these graceful structures. The Louth staircase, pictured, features a classic stop-chamfered balustrade. Manufactured from high quality American white oak with cut strings and pyramid newel caps, these stairs make a stunning focal point for this grand entrance hall. See Case Study no.2 for more details and pictures. The more gently curved splayed staircase is an equally impressive way of enhancing a hallway. 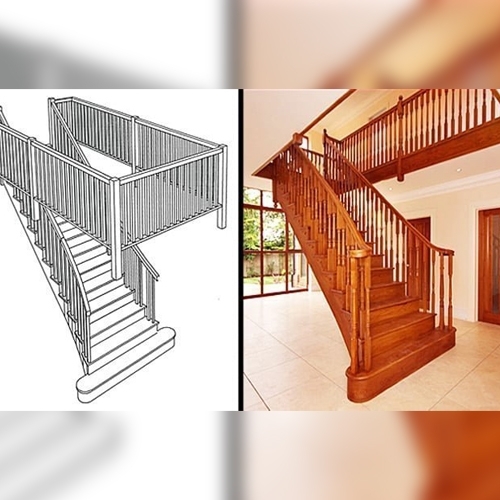 Either one or both strings of the staircase can be splayed (spread outwards), depending upon the layout of your property and individual preference. While this style is a little more understated than curved stairs, the elegance of the splayed staircase still creates a wonderful impression, making a powerful design statement. Its individuality will set your stairway and your home apart. 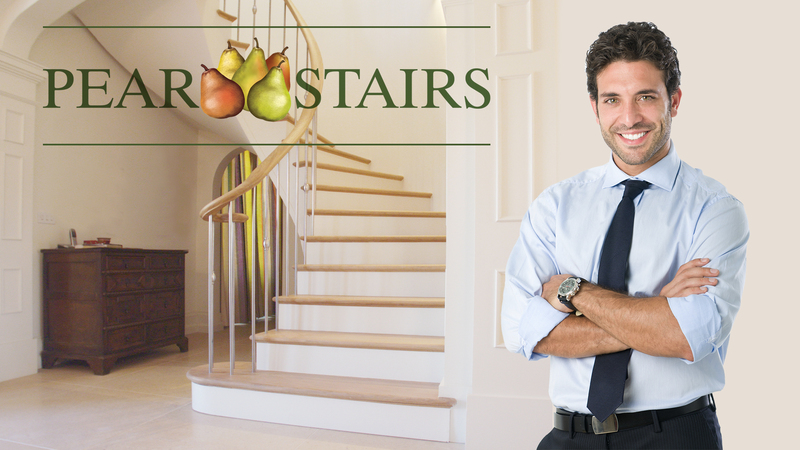 A Pear Stairs custom-made curved staircase is the height of sophistication. Carefully designed and beautifully crafted from traditional oak, it will enhance any hallway. Our imposing Compton splayed staircase looks right at home in this large reception hall. With two elegant wreathed volutes (curved handrail ends), it provides a superb centrepiece for the property. The stairs are made from American white oak, with fluted Oxford newels and spindles. See Case Study no.108 for more details. Every staircase is unique and tailor-made to precisely accommodate the customer's needs. The Carrodale curved oak staircase, for example is splayed only on one side because it is positioned against a wall. The sweeping continuous handrail and volute newel post make a graceful addition to the reception hall. For safety, we added extra balustrading to the landing to protect the stairwell. Take a look at Case Study no.129 to find out more. American white oak is a strong and heavy hardwood grown in the eastern states of the USA. It has a cleaner and, some would argue, more modern appearance than its European counterpart. This is one of the main reasons why it is the most popular choice for curved staircases in new or renovated properties, where the customer is looking to combine contemporary style with traditional elegance. The timber has an attractive knot-free grain and varies in colour from light tan to a rich brown, making it an interesting and versatile material. The more rustic-looking European oak is another high quality timber commonly used in the production of curved and splayed staircases. Its knots are larger than those of the American white and the straight dense grain, along with its slightly darker colouring, gives this wood a distinctive charm and character all of its own. 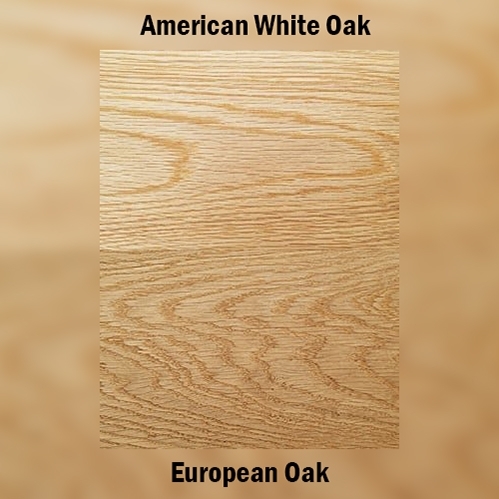 As European oak is less widely available, it is more expensive than the American variety. All stairs need a string on each side to support the structure. Also known as a stringer, this is the wooden housing on either side of the stairs into which the steps are fixed. It can be made either to conceal the edge of the stairs from view (closed string) or cut and mitred to the shape of the steps (cut string). Most of our curved and splayed staircases have cut strings, which show off the profile of the treads and risers. Their shape is clearly visible from the side and this more ornate style adds character. 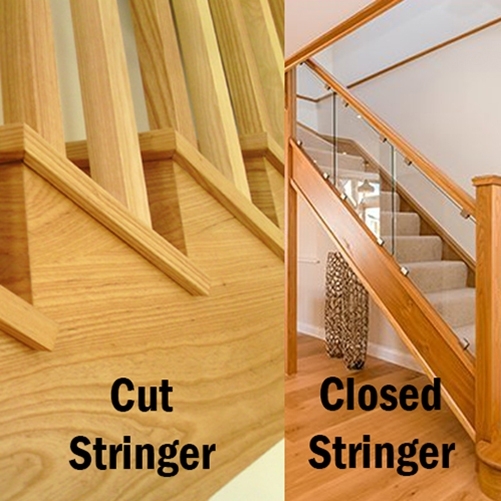 Cut strings are connected to the treads and risers of the stairs by three-way mitre joints, which provide the staircase with extra strength. The edges of each part are bevelled at 45⁰ which join neatly together to form right angles of 90⁰. The cut strings of the staircase are further embellished by the addition of return nosings. Nosings are the shaped edges at the front of the treads. Return nosings are rounded mouldings which conceal the end grain at the side of the treads, giving the stairs a clean, smooth finish. The end of the return nosing extends beyond the face of the riser by the same distance as its width. The curved shape of the return nosing design developed by our skilled team at Pear Stairs is unique, allowing it to seamlessly conform to the sweeping arc of the staircase. You can choose from an impressive range of decorative spindles, newel posts and newel caps to personalise your staircase and make it stand out. These are available in American white and European oaks, or any other timber you may select for your curved or splayed staircase. The splayed Compton staircase incorporates the Oxford fluted newel posts and spindles to complement the continuous handrail which is enhanced by two wreathed volutes. All of these accessories were made from American white oak to perfectly match the sweeping staircase. At Pear Stairs we offer a wide variety of handrails - another way in which you can add individuality to your curved or splayed staircase. The Carrodale staircase, pictured right, features a continuous curved handrail complete with a decorative volute, all constructed from premium American white oak. As well as handrails that run along the length of the staircase, we also have a number of different balustrades for landings. An extra curved balustrade was specially designed for the top of the Carrodale staircase, pictured left, to run along the landing and protect the stairwell. A bullnose step or a D-end step can be added to the bottom of a curved or splayed staircase. Whilst a bullnose step is curved on one or both sides, the tread of a D-end step passes the newel post on the balustrade which then returns back into the side of the newel. Both designs will serve to complement the graceful curve of the staircase, creating a distinctly sophisticated impression in the entrance to your home. If a continuous handrail ends with a volute, the staircase will have a curtail step at the bottom to accommodate the volute and newel post. The design-led manufacturing process incorporates a significant level of innovation. This has impacted the selling price, yet the quality of the staircase has not been compromised. The picture on the left shows one of our curved staircases from above during production. All our curved staircases are made on a bespoke basis to fit individual requirements. To chat to one of our expert designers, click on the web chat link at the top of the page during office hours or call 01938 553311. We also sell a number of products to finish your staircase in our online shop. If you have any questions don't hesitate to phone us on the above number.